SteelSeries has introduced a new Arctis gaming headset with a clever trick up its sleeve: the ability to hear audio from both a Bluetooth source and a wired connection at the same time. 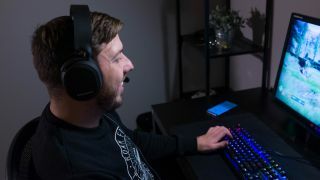 You can hook up the Arctis 3 Bluetooth to a PC (or Mac, or console) via the cable and hear audio from that source, while simultaneously connecting the headset via Bluetooth to your mobile device, and also hear the audio from that. In other words, you can hear the sound from your game (from the 3.5mm wired connection), while, say, taking a call or engaging in a chat on an app installed on your phone (via the Bluetooth connection). Or you could stream music wirelessly over the Bluetooth connection for your own soundtrack to the game (while still hearing the in-game audio). It’s a nifty little spin on the traditional gaming headset, certainly, and as well as the PC, as mentioned it’s compatible with consoles including the PlayStation, Xbox and Nintendo Switch. The Arctis 3 Bluetooth headset also benefits from ‘low-distortion’ speakers to keep audio crisp, along with a SteelSeries ClearCast bi-directional mic which is retractable for convenience, and eliminates background noise. There has been some thought put into comfort levels, too, with ear cushions fashioned from an ‘AirWeave’ fabric, and a ‘ski goggle headband’ that’s designed not to get uncomfortable even for longer gaming sessions. The headset is on sale now and retails at $130 (£134.99, around AU$170). Which is the best PC gaming headset of 2017?